It always amazes me that the same enlightened person, who advocates a wholesome natural life style for themselves, does not necessarily apply these same and equal principles when caring for their four legged companions. We, as humans, are very weary of chemicals and poisons when using shampoos and grooming products on our own body, yet indiscriminately and without much thought we apply harsh shampoos and flea repellents onto our pets. Is their skin really that much tougher than ours, and devoid of feeling? The modern consumer also appreciates the nutritional values that are derived from organic, wholesome and fresh produce. Yet, when it comes to feeding our companion animals, we ignore all that we believe to be true. Some of the most processed and preserved food on earth is kibble, the staple diet of many of our pets, sold through supermarkets and veterinary clinics. It is a multi-billion dollar industry. Everyone is getting richer, whilst our pets health is getting poorer. Almost every pet is struggling with some sort of skin disorder or allergy, the first sign that something is going wrong. To make matters worse, each year there are new ranges of kibble that land on our shores. Many claim to have the best formulation ever. Some claim to only use premium ingredients in their recipe and others boldly claim to be naturally preserved and holistic. No food can sit on a dry shelf without being preserved. Kibble can enjoy a shelf life of 12 months. Some of the preservatives used are also dubious and many pet food companies still use preservatives that are outlawed in human foods. We often find that the pet food labels claim that their food is “naturally preserved” or contains only “natural preservatives”. But are these natural preservatives “natural” and more importantly can they really claim to be totally safe? This is probably one of the main reasons why our pets, and in particular cats, struggle with uninary infections, bladder disorders and renal complications. Dogs and cats rely on their nutrition for their liquid intake. Nowadays, we find that our pets are drinking copious amounts of water so compensate for their state of dehydration. However, the water is not being retained effectively, as it would be with diets that are naturally enriched with moisture. A dry kibble would have no appeal to our companions if they weren’t saturated with fats or digestives. This makes a dry inappropriate diet more palatable and enticing. But any chef will tell you that there are good fats and bad fats and that fats and oils have a “smoking” or “burning” point. That is the temperature at which a fat or oil will burn and turn rancid and loose nutritional value. Olive oil or peanut oil has high “smoking” points, but rendered fat, commonly used in kibble food, has very low smoking points. That means that even on a relatively hot day in South Africa, your packet of kibble is at risk of turning rancid, unless stored in a cool place or fridge. Rancidity is one of the main causes of irritable skin and related allergies. Athletes, before an event, would “carbo-load” to build up energy resources. High carb diets have the same impact on our pets. Most of our pets and certainly with specific breeds, already have too much energy and are hyper-active. 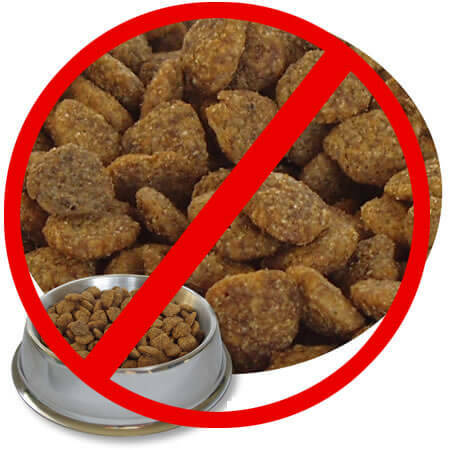 A kibble diet will surely exacerbate energy levels, the result being that our pets become out of control, less disciplined and generally misbehaved. Hyper-active pets are likely to chew themselves and show signs of irritation and discomfort. High carb diets are also high in acidity, which not only affects behavior but joints and skeletal development. Perhaps this the reason why so many of our animals struggle with arthritic issues. A very important part of bonding between parent and child is through feeding and at the dinner table. We yearned for our favorite dishes that mom prepared, tomato bredie, curry, spaghetti bolognaise. It was at the dinner table that respect was earned and demanded. There was a strong sense of unity. Nowadays, we chuck a bowl of kibble on the ground and leave abruptly. No love, no nurturing, no expectations and no inter-action. Still, we expect sterling behavior from our companion. This is an unrealistic demand when we actually have not earned the respect or the bond. While the manufacturers claimed that our pets could thrive on a diet consisting of nothing but commercial dried food, research and an increasing number of veterinarians implicate processed dried pet food as a source of disease or as an exacerbating agent for a number of degenerative diseases. Certainly, we are finding that suddenly the longevity of our pets has decreased and that many of our companion animals are suffering from common ailments like skin allergies, diabetes, epilepsy, renal complications, arthritic conditions, dental disease and cancer. Our pet’s metabolism is not designed to consume food that is over processed, cereal and carbohydrate-based and that contains a variety of additives, preservatives, flavourants and colorants. Therefore, there is no doubt that dry kibble food is an inappropriate and an inferior diet. The highest quality of nourishment comes from whole natural and enzyme-active foods that are not refined, processed, exposed to high temperatures or laden with preservatives.